All of us are aware that if we take excess salt it can raise the chances of high blood pressure due to the sodium content it has. But is salt the only source of sodium? No. 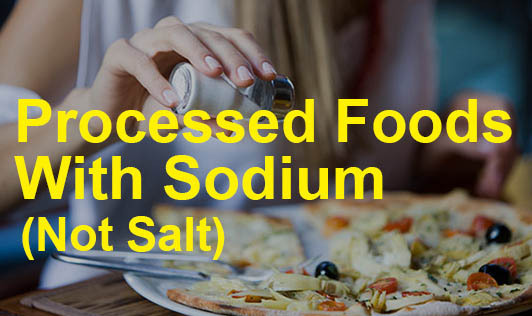 Sodium is naturally present in small quantities in some foods like milk, fish, egg, meat, etc. But the sodium quantity that comes from processed foods is far higher. Sodium is present not only in the form of salt in processed foods, but also other compounds. Baking powder / baking soda - used in breads, cakes, instant foods. Disodium phosphate - used in powdered products, instant foods. Monosodium glutamate (popularly called MSG) - used as flavor enhancer in many foods, particularly Chinese cuisine. Sodium benzoate - used in ready-to-eat salad dressings and sauces. Sodium nitrate & sodium nitrite - used in curing meats and sausages. Sodium propionate - used in pasteurized cheeses and baked goods. Next time you buy a processed food, read the label and count it in your sodium intake. That's one way of controlling your sodium consumption and preventing high blood pressure.